FRAMECAD is delighted to present you the latest DOUGLASS COLONY project, Mariposa VII, a 7-storey multi-family building in Colorado, USA. Mariposa VII was completed in 1/4 of the time. The 7-storey multi-family building was fabricated at Douglass Colony's headquarters using the FRAMECAD System and shipped directly to the jobsite where the building was erected in a total of 40 working days. Douglass Colony supplied the pre-panelized metal stud wall framing and offered a turn-key solution with diversified builders as the contracted drywaller. 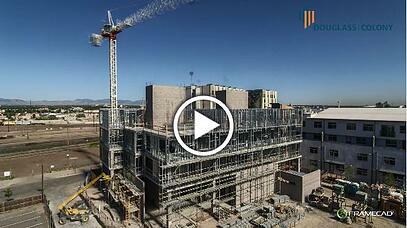 Watch the speed of construction in the video below. Please click here to read all the full case study on the Mariposa VII construction project. Douglass Colony can deliver an unmatched level of quality and efficiency to your commercial construction project. Let us streamline the entire design build process for you! Get in touch with a DOUGLASS COLONY expert today.